While I've owned the TMCC equipment (CAB-1, Command Base, etc.) for several months now, I just bought my first command equipped engine several days ago. Lionel did an exceptional job on this system. I especially enjoyed the transitional command control part of it. Remote control is nice, too. Since I am fairly new at this hobby, and my other locomotives only have horns or whistles, I was amazed by Railsounds. Using Electrocouplers is a lot easier than using those uncoupling track sections. It used to be very annoying to try to position the coupler disks under the electromagnet (that was before I discovered you could use those track sections while the train was moving). The engine I purchased was the B&O GP-9 from the Lionel 1999 Preview Catalog. It has strong magne-traction as well as good decoration. Lionel did a great job on both that engine and TMCC. TMCC has proven to me once again how terrific it is. Last night, I had three engines running on my partially built layout. I was able to walk about the layout checking and slowing down any engine at any given spot where I was standing. This enabled me to check how the switches were working, track connections and clearances, such as passing through the new two track Lionel Hellgate bridge. It is very convenient to be able to control all operations from any point you may be. Something funny that was happening, was I had not assigned each engine its own number, so when I touched the whistle button I had a chorus of whistles/horns to listen to, thank goodness for the volume control! 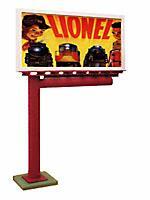 Lionel is the direct track to your children! Have dual main-lines - and (ack - blasphemy again) one of my 8-year-olds favorite activities is to put his loco/consist on one track, and I put mine on the other - we then proceed to "race" - he's got a CAB-1 and so do I - and here's the hilarious part - I have to constantly reprogram my loco and change the address number cuz he's figured out how to "cheat" - he'll access my loco and shut me down if I'm winning - I love this stuff. Kids these days are 'high tech' - So give 'em a CAB-1 - they can relate to it, and they can be creative as well (about learning to shut down my loco..LOL). Keep the kids happy - keep 'em interested - I laugh, they laugh and we spend $$ - Thanks, Lionel for giving me the opportunity to spend more quality time with my children! (why did I say "Thanks, Lionel?" - because when I put the trains in conventional mode, it has nowhere NEAR the kid-appeal - they get bored very quickly). My godson was over this past weekend, along with his parents. Among other things, going to the Smithsonian, seeing the White House, walking on the Mall, Keifer and I managed to run some trains. I bought a second Cab-1 recently. Put it in his hand, showed him the throttle, and away we went. I let him run the J1E w/ the pass. cars first, as it is virtually impossible to get that loco and cars up to "Oh sh*t speed." Took him a few laps, but he got a feel for the "Johnson bar." Next was the whistle and bell. "Press ENG, then 1-9, now you are controlling the GP-9 1997." (I use the first two numbers for the command address. J1E is 53.) He ran that train, and I ran the J. He learned the operation of the Cab-1 rapidly. Showed him once, and he got it. He's 7 and a half, of average intelligence. Then he started "stealing" my train, so I showed him the "HALT" button. Then I challenged him to stop the Gp powered train with the Giraffe's head bobbed down inside the car. That took him about 15-20 tries, but he finally got it. TMCC gets kids hooked on the idea of a remote control train, which then lets them notice another facet of the hobby; Running trains is fun. Show them the same exact layout using conventional control devices, Z-4000 or ZW, and the reaction is tame by comparison. "I still have the "Christmas" layout up in the dining room. We were running the switcher and a NYC GP9, all under TMCC. It sure was fun swapping train consists, (electrocouplers on the fly) and racing each other around the loops. The switcher is a noisy little bugger, but it now it runs well in both directions. Yea, if you look you can see the wires. This is a fun little engine, and a very good puller, most likely due to the cast frame and the traction tire. In my opinion, running trains this way sure is a lot of fun, that is under full TMCC. I like everbody's trains, but I am sure in the future, ALL of my engines will be converted to TMCC, using Train America's product, or one from someone else. Nothing like an evening with trains to pass some quality time with my 12 year old son. Only a one week semester break, I was glad we could spend a night running trains. them notice another facet of the hobby; Running trains is fun." Exactly how my 5 1/2 year old daughter is. She wants a CAB1 for herself so much. As soon as she see's me going to turn the power on she always asks me when I'm going to get hers. I'll soon be ordering it. Very fun to watch when she's running everything by herself, accessories and all. Don't even have to preset the top speed. She's knows how fast they should go. She likes the CC steamers and diesels but her favorite to run with the CAB1 is of course, Thomas. I have found that I enjoy running my new Lionel engines like the Century Club Berkshire, GP9s, Warhorse J and Lionel Torpedo more than I do my Lionel postwar. My Century Club Berkshire runs better than any other engine I have seen, including Lionel postwar. Add the Railsounds system and TMCC and it just blows away the old stuff in the fun to operate factor. Here's a new story for you: Last Sunday my grandfather was over at my house and I was running his old postwar engines on my layout. He was glad to see them running but it was no big deal. Next I put on the Warhorse J locomotive to show him what Lionel is doing now. Right away he was amazed and fascinated with the Railsounds. It immediately brought back memories of traveling by steam train. To my grandfather, that Lionel J was the steam engines that he remembered in his younger days. To him the Railsounds brought the whole layout to life. As for me, I'll never go back to transformer handles again. I have been recently purchasing the Century Club issues and have enjoyed operating them. Not being a Lionel fanatic, however, I have not until recently tried these pieces using TMCC. While visiting during Christmas week a tried and true train store back home (Henning's Model Trains in Lansdale, Pa., where I have been a customer for 30 years. ), I had the opportunity to buy a brand new TrainMaster Command Set (CAB-1 remote and Command Base) for $95.00 as part of their 60th Anniversary sale. At this price, who would quibble? Today, I connected the TMCC system to my prewar American Flyer layout (where I run all of my "non-two rail stuff"), and I must say I am very impressed. One definitely obtains the most effective and best results with the CC engines with the TMCC system. I particularly liked the "remote anywhere" uncoupling capability and the brake squeels. Although I generally prefer running old toy trains as the antiques they are, the control that one obtains in the operation and sounds of the newer TMCC-equipped Lionel engines is superb and a lot of fun. Although there are NMRA-approved DCC systems that have been applied to other gauges (HO and S), this is the best and simplest to use remote system that I have personally experienced. I now see why many of you on this board are enthusiastic about TMCC. Well, another Christmas has just about ended. For me, I just seem to have just gotten another year older. But it also makes me realize that my two kids are also a year older. When they are young (2 and 4) you really notice the change. This year was a wonderful Christmas for me and my wife. My son (4) made it, probably the most joyous one yet. He has developed his own tastes and wants. For it was he who re-sparked my interest in trains. I am a fan of the PRR, NYC and the NY, O&W. He for reasons I can't figure loves the Southern Pacific Daylight. I keep telling him it's the wrong coast, but he just won't listen. So this year was a SP Daylight Christmas for him. I personally would have preferred a Commodore Vanderbuilt Christmas. He became interested in trains from watching Shining Times Station with Thomas the Tank Engine. Last Christmas, (using some tips gathered from this board) I made a small layout under the tree to run the Thomas, Annie and Clarabel trains my parents bought for him. This year, using that same layout, Thomas was pulling the new addition to the family, Harold on a flat bed. When he came downstairs to see his trains running with Harold, his expression and outburst were priceless. He then began opening present after present. He received several train books, a new Lionel watch, a new Daylight pin for his conductor's cap, a framed SP Daylight print signed by the artist, the new Lionel Great Railway Adventure set with the Diecast Daylight, story book and tape among other none related train gifts. I saved for last, one special gift for him. He began to open it and immediately recognized it as the new Lionel SP Daylight. He was ecstatic, until he realized the box was empty. I snuck off to the living room where I previously set up a large oval track with the Daylight on it, hit the wake up button on the Cab-1. When the Daylight turned on he dropped the box and ran into the room as fast as he could. The kid was overwhelmed with excitement. He played with that engine for hours. He loves hitting the Tower Com and making the "man" say "SP Daylight cleared for Departure." I especially get a kick out of him hitting the Crew Talk. He puts his hand over his mouth and does the garbled speech thing. You know, my family thinks I'm crazy for spending that kind of money on a 4 year old. But this is truly something (Daylight) he has talked about for the past year. I told my wife "Don't buy me anything, let's get him the Daylight." I didn't sacrifice a thing. And maybe I am crazy but those are the types of memories you will never forget. And just so he will always cherish that moment my wife recorded the whole thing on video. And if you think I'm crazy, guess where my wife wants to spend our 10 year anniversary? She is planning a trip to Railfare 1999 with the kids to see the Daylight in person. We are hoping for a Daylight excursion. Yep, more great memories to come. I always envisioned a re-lived Honeymoon in Maui Hawaii. Well, what the hell, we did that once, maybe on our 20th.